... because, if you confess with your mouth that Jesus is Lord and believe in your heart that God raised him from the dead, you will be saved. WHO IS CALLED TO SPREAD THE GOSPEL MESSAGE? It is the call of EVERY believer to make disciples. Some of you will be gifted in evangelism, some of you will fumble your way through it. Either way, you can go knowing that it is the work of the Holy Spirit working through you that will speak to the hearts of the lost, not by your eloquent words. And thank goodness for that, am I right?! 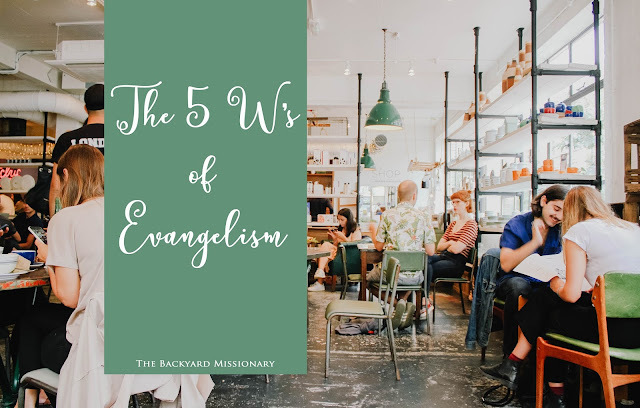 Evangelism comes from the Greek word euaggelion. When this word is translated into a noun is means “gospel”, but when translated into a verb it becomes “announce” or “bring good news”. In simple terms, the bad news is that as sinful humans we are separated from God. The Good News is that God sent his Son, who paid the price for our sins so that anyone who turns from their old nature can be assured of our freedom from condemnation and live eternally with our Father in Heaven. WHEN ARE WE CALLED TO EVANGELIZE? This one is more of a matter of listening to the gentle tug of the Holy Spirit, than a concrete answer. Perhaps you are out and someone is suddenly standing in front of you pouring out their life story, you are wondering what is going on when suddenly you feel that prompting in your heart. Or, maybe God gives you tunnel vision to see just one person in a crowded room that you are to interact with. There are many ways God can grab your attention, but the bottom line is be obedient...even when you are shaking in your boots. It’s ok. Remember, Moses led a nation with a speech impediment, because God was on his side. He is on your side too! 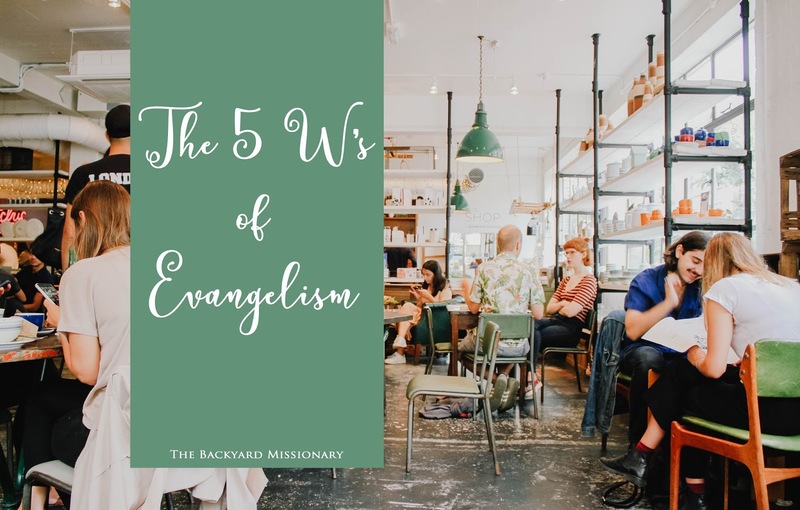 WHERE ARE WE CALLED TO EVANGELIZE? Some of us will be called to a varying assortment of places around the globe, but where you are TODAY is your mission field. Perhaps one day you will be called to serve elsewhere, perhaps you are even keenly aware of where you will be called, but your mission today is where your feet are. It could be the grocery story, your kid’s school, at the gym, the mall, the library, your walk around the block, the bank teller- I think you get it. There are people all over this world, in every neck of the woods that are hungry to hear the Good News. You don’t need to travel far to find someone whose heart is being stirred by the Holy Spirit. WHY ARE WE CALLED TO EVANGELIZE? If you are a professing Christian you know the very best news that this world can possibly offer!! You have hope of an eternal future with a Heavenly Father. There is no other message like this in the world! Trust that! If you know this message and it is what shapes your daily life than you belong to the Church. God made US His hands, feet, mouth, ears, and body. We are here to bring a message of hope to a bleak and grisly world. It is from your mouth that God’s Truth will speak out over the lies that lost souls have believed. God will use you to point them towards the door that He is patiently knocking at. The Holy Spirit will use you in your willingness to spread the Gospel! Remember that faith is a journey we are all on. Some are just getting starting, some are a little further along, and others are much further down the road. When you meet someone who you know God has ordained to be in front of you, be listening for His guiding words as you interact. Maybe your not-so-accidental encounter was only meant to plant the seed of the gospel. Do not be discouraged if you only make it as far as a prayer for a person in need. It is the beginning of a journey for them. Perhaps you will meet up with someone who is further in faith and wrestling with answers when God brings you to them. Whatever the case may be, listen for the promptings and thoughts that the Lord plants in your heart and mind as the conversation unfolds.